My father had a unique way of getting boys to steer clear of me in high school. Right before date night o’clock, he would send me to the local pizza joint to pick up his pizza. This sounds innocent enough – a man’s gotta eat. But, he insisted on his favorite topping each time: anchovies. That anchovy stench would seep deep into the seats of my Ford Focus. It even clung to my clothes and my hair. So naturally, I developed an aversion to anchovies that lasted until my most recent trip to Etto. 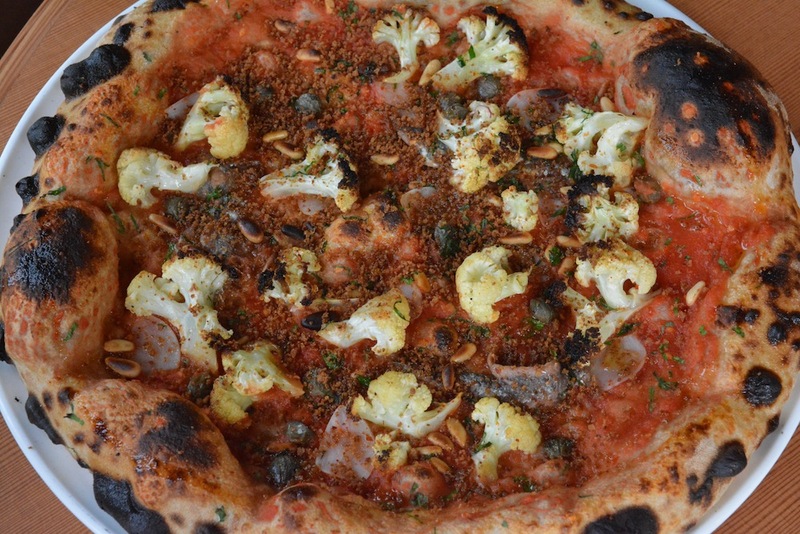 It was there that I tried the Best Thing on the Menu: Roasted Cauliflower Pizza with capers, pine nuts, anchovies and bread crumbs. The anchovies are so briny that no other salt source is needed, and they add just enough subtle funk to make the pizza memorable. Etto, after all, has a real love affair with these little fishies, as they also serve them as a part of their salads/small plate selections. But back to the pizza, which is like none other in the city (Except maybe 2Amys, which is from the same owners). What differs slightly is the dough and how it’s cooked. The flour is milled in house. In fact, you can see the mill in the back of the restaurant. What results is a crust with billiard ball sized bubbles that you and your friends will fight over when divvying up slices (also just like high school). The restaurant recently opened up their sweet little patio, so there’s a better chance of getting a table and eating The Best Thing on the Menu al fresco. Also try Etto’s strong selection of small plates, they make a good warm up to the main event. Roasted cauliflower pizza not your BTM? Share your favorites in the comments section. Etto is located at 1541 14th Street NW. You might also like Casa Luca or Lupo Verde. This entry was posted in Restaurants and tagged 14th Street, 2Amys, Anchovies, Best DC Pizza, Etto, Italian, Patio Dining, Pizza, Roasted Cauliflower Pizza. Bookmark the permalink. Love the pizza but I think the rotating selection of small plates are even better. I love ordering the burrata, a selection of the delicious meats, and then the octopus served with white beans and drenched in olive oil. To die for.